Sharks are some of the largest, most fascinating creatures in the ocean. These awesome sea creatures have inspired books, movies, and even a number of party games for kids. 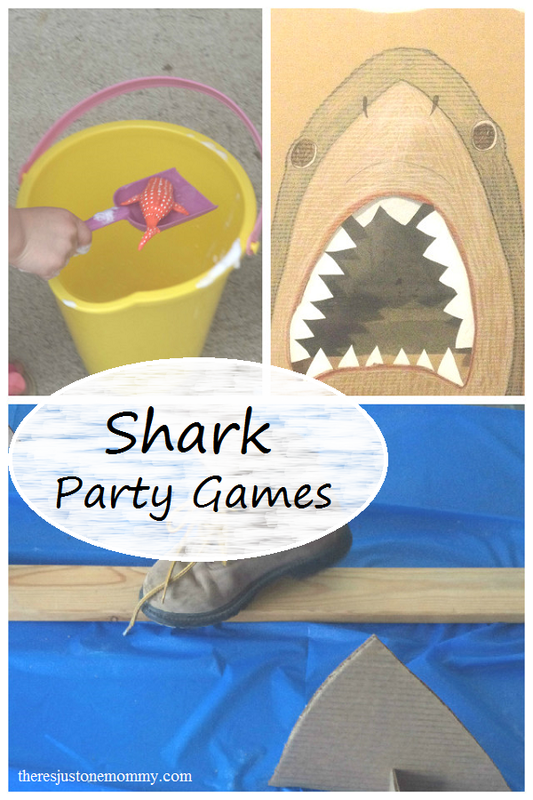 These shark party games would be perfect at a birthday party or for family fun during Shark Week. Like so many boys his age, my son loves sharks. 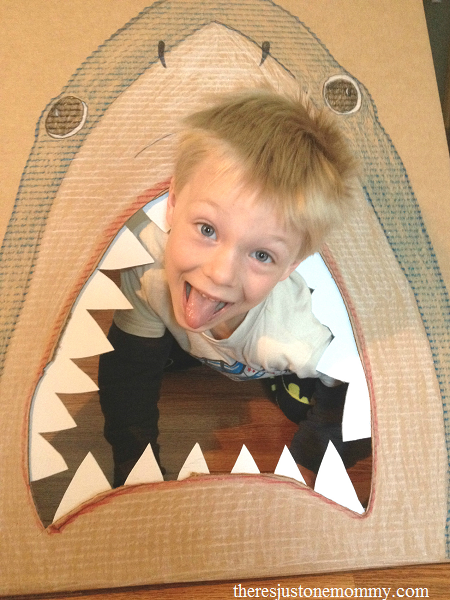 He has even had a shark-themed birthday party, complete with a “Jawsome” shark cake and these DIY party games. 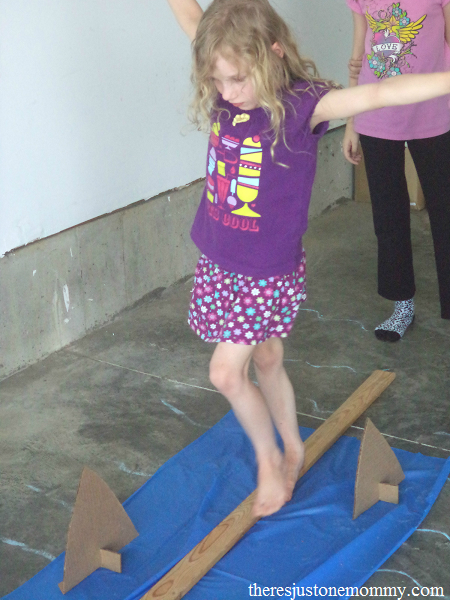 These 4 simple DIY Shark Games are perfect for a shark birthday party. They’d also be fun to play during Shark Week in June. 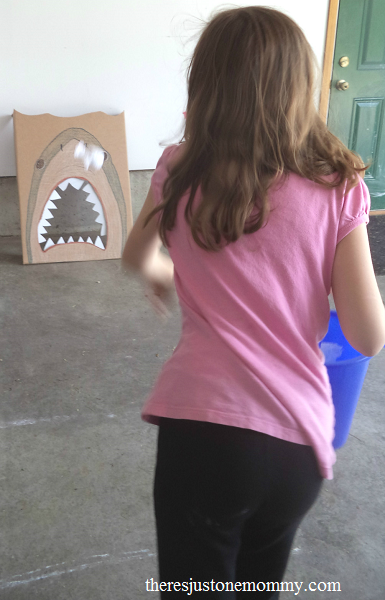 To feed our shark I taped tissue paper tails to some pretend snowballs we have to make fish. (I like to go with the idea that simple is best!) You could also use plastic ball pit balls if you have some on hand, or just borrow a few rolled up pairs of socks. The kids had fun tossing fish into the shark’s mouth. Related post: Jawesome Kids Shark Books. Another very simple party game is “keep the shark away.” Use a permanent marker to draw shark faces on blue balloons. 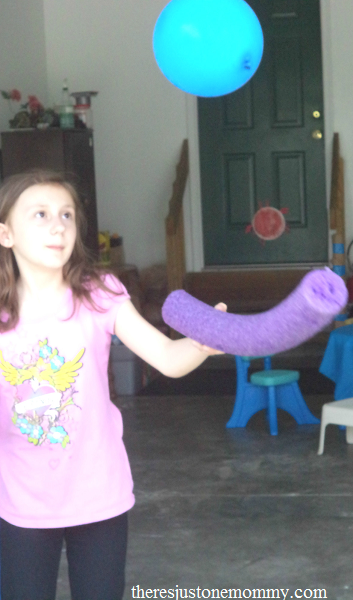 Cut several pool noodles in half. The kids will have fun keeping the balloons in the air, not letting them touch their bodies, using pool noodles pieces. A wood board makes a fun plank for this game. To give it a shark twist, use a piece of blue plastic tablecloth and put it under the plank as water. 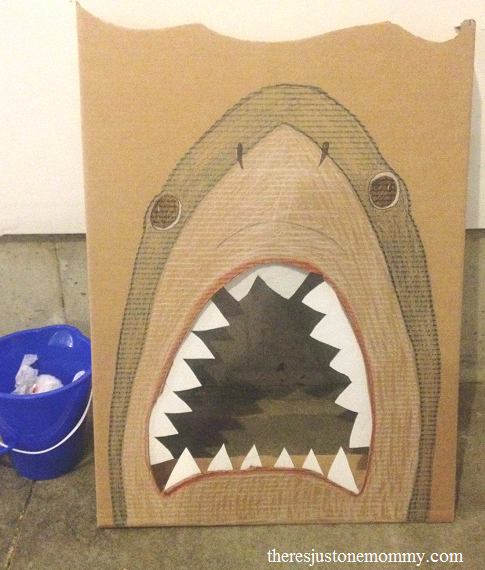 You can make shark fins with triangles cut from cardboard and small rectangles of cardboard with a slit in them slid onto the triangles to help make them stand. Finally, we had fun saving the sharks and other sea animals in the Save the Sea Animals game I posted about earlier. There you have it, simple and fun shark party games, just in time to add to your Shark Week activities. Originally published June 20, 2015. 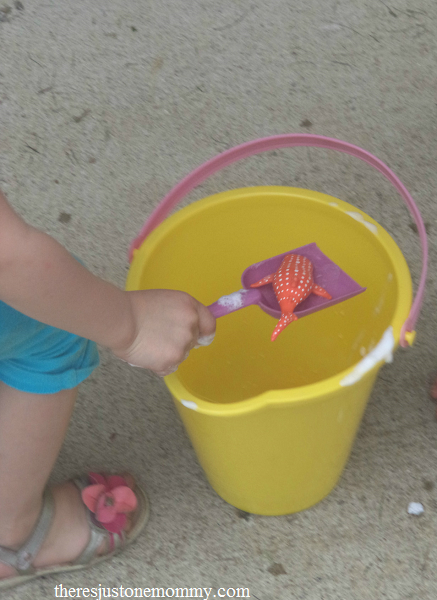 Thanks for sharing these cute shark party games with us at Mommy Monday! We are in a full swing with shark activities in preparation for Shark Week! Thanks for the additional ideas! And we will be making Shark Cake tomorrow! We enjoyed several of these ideas at my son’s birthday party recently. Sharks are always popular!